Click to visit other IWSG bloggers! You love to write. But you didn’t realize the change that would happen once you earned your first, second, third, and fourth writing goals. You didn’t realize you’d lose your late nights, early mornings, and weekends writing and writing and revising in order to meet the deadlines on the contracts your agent somehow managed to snag for you. But it’s worth it, because you’re meeting your writing goals, and you love to write. You get bags under your eyes. You buy Advil in bulk for the headaches. You notice your hands cramp more often. You drink vodka to loosen up. You guzzle espresso to stay up. You take a prescription pain killer, because you think the headaches have turned into migraines. And still the words come to you. The scenes you must put from mind to iPad/computer/phone before the next flood of ideas jumble out of your brain. And you hate how you’ve stopped smiling, stopped sleeping through the night, stopped noticing the little things that matter… Like the fine lines and wrinkles from squinting and the delicious flavor of tomatoes. So you old-school it for twelve weeks. You grab a notebook and your fave Montblanc, and you recall how much you love to print, to use cursive, to curl up somewhere, and to fill blank pages – tangible blank pages – with characters and dialog and description. And you get outside more, and stay inside less. You take walks that turn into runs that have you drinking a gallon of water. You get a sunburn from being careless in the Caribbean on a cruise just because you can, and you throw out the prescription pain killers, because the headaches stop. When the twelve weeks is over, you return to type up your notes – book three in the South Beach series – and you miss your computer, but you are not chained to it like your entire life depends on it. You have found other places to create, to document your ideas. You can do this. Without the alcohol and the pain killers. But maybe the espresso can stay. As always, thanks for stopping by! 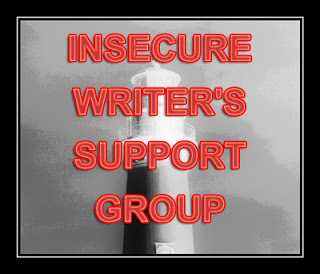 Be sure to visit the other #IWSG bloggers! It’s so hard finding the right balance in life, especially when you have deadlines to meet, and the muse calling to you. but it sounds like your 12 weeks away did you good, and you’ve found a nice rhythm now. Good luck with your April literary endeavors. LOVE this post . . . you made me cry! I also love to mix writing on the computer and writing by hand. When I need a break from one, I can switch to the other. And the change kind of does feel like a holiday. Long walks are also an important part of my writing. And coffee. Definitely coffee.